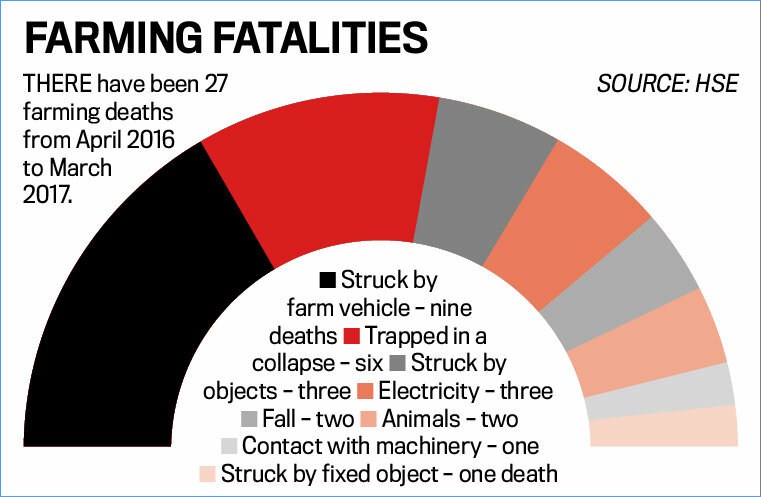 As deaths on farms reach dreadful new highs, Abi Kay looks at several new technologies coming to market which could help keep farmers and their families safe. Clive Blacker, managing director of Precision Decisions, decided to create a topple alarm for quads after one of his employees was thrown off a bike, breaking his arm and injuring his leg. “Even though we do train our operators, we actually had a terrible accident”, Mr Blacker said. Topple Alarm uses GPS and gyro sensors to determine when a quad bike has passed a certain threshold of angle or tilt. When this happens, a pre-determined set of people are sent an alarm via text message or email with the location of the vehicle, information on the operator and the time of the accident. Someone on the alarm list must accept responsibility for the flag or cancel it. Behaviour alerts can also be sent to the alarm list if someone is driving a quad dangerously. Work is ongoing to add anti-theft devices such as an immobiliser to Topple Alarm, but Mr Blacker estimates the product will be ready for release by the autumn, at a cost of around £300 plus annual subscription. Chris Moore, managing director of Chris Moore Networks, has broken new ground with his RURAL SIM card. The SIM gives mobile phone users the ability to roam between three network operators, offering much greater opportunity for coverage in rural areas. Mr Moore said he wanted to support the Yorkshire Air Ambulance with the SIM card after having used the service when a bridge collapsed on a sporting shoot he was attending. “If farmers have got signal, it helps with health and safety because if there is a problem, then they can always get in touch”, he added. The company has already built up a farmer client base. “One of our customers who has a farm on the North Yorkshire moors has never been able to get a signal on their core site, so they tested our SIM and they now have signal”, Mr Moore said. There are a range of pay-as-you-go tariffs on the SIM, with the lowest costing £15. Mr Moore has plans to trial the SIM alongside his Lone Worker App for smartphones, which uses an impact sensor to trigger an alarm for assistance when a worker collapses. The app also allows users to set a timer when entering a hazardous area such as a slurry store. If a worker has not exited the area after a certain amount of time, an alarm will be raised. New Zealanders Michael Falconer, Juliet Maclean and Ryan Higgs set up OnSide because they were frustrated with previous systems for managing farm safety across their multi-farm dairy business. Farmers using OnSide have a virtual boundary around their farm called a ‘geofence’. Within the geofence is a risk register, organised as pins on a map. Behind the pins is information on each risk, and what is required to stay safe. Anyone who arrives on an OnSide farm, whether visitor or employee, is prompted by the app to sign in and review any risks. The map can be viewed at any time and anyone can report new risks as soon as they are seen. Ryan Higgs said: “OnSide provides everyone working on or visiting a farm with the information they need about risks, in real time and in a simple to understand and consumable way, right on their mobile. Farmers in New Zealand pay $10 NZD (£5.60) per user per month for OnSide. The owners are looking to open the app up to British users in the coming months. Alma Jordan was inspired to create the AgriKids gaming app after five children were killed on farms in Ireland in 2014. “I remember I got an alert on my phone to say a child had been killed and it had been the second death of a child within three or four days”, she said. 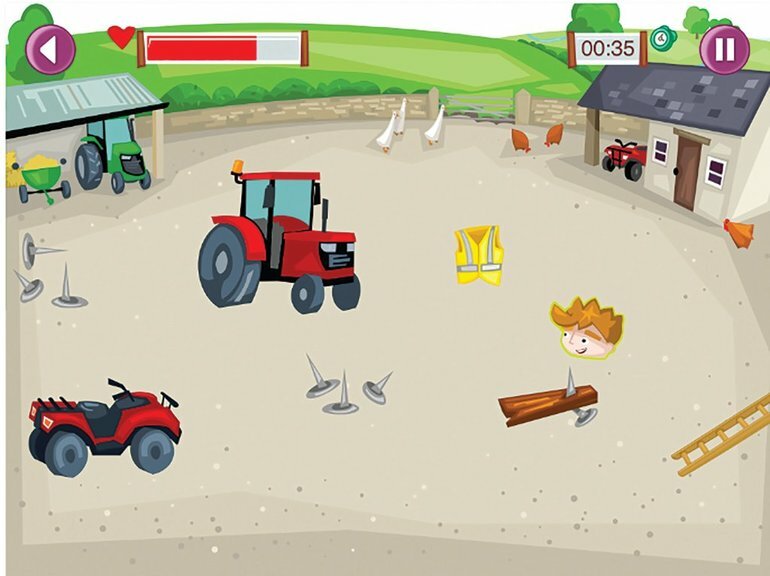 Children playing AgriKids have the choice of three games – Dodge the Dangers, Stop the Bales and Blackberry Picking. In Dodge the Dangers, players have to move their chosen character out of danger as machinery comes at them. If they are hit, they lose a power source. As the levels go up, the dangers get faster, and players can protect their characters by putting on a helmet or the hi-vis gear. In Stop the Bales, players have to protect children from falling bales, and in Blackberry Picking, kids learn to avoid thorns, wasps and bees as well as red berries. Dodge the Dangers is free to download on Google Play and Apple’s App Store. The other two games cost €1 (89p) each.